Western Blot analysis of BARX1 expression in transfected 293T cell line by BARX1 monoclonal antibody (M01), clone 1E7.Lane 1: BARX1 transfected lysate(11.5 KDa).Lane 2: Non-transfected lysate. 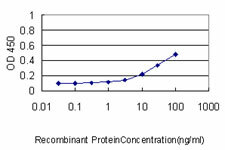 Detection limit for recombinant GST tagged BARX1 is approximately 0.3ng/ml as a capture antibody. BARX1 monoclonal antibody (M05), clone 3C11 Western Blot analysis of BARX1 expression in HeLa NE ( Cat # L013V3 ). 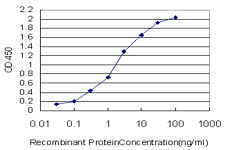 Detection limit for recombinant GST tagged BARX1 is approximately 0.03ng/ml as a capture antibody. Western blot analysis of BARX1 polyclonal antibody ( Cat # PAB2849 ) in CEM cell line lysates ( 35 µg/lane ) . 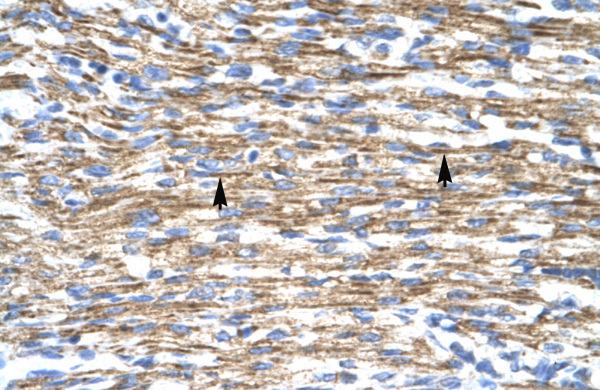 BarX1 ( arrow ) was detected using the purified polyclonal antibody ( 1 : 60 dilution ) . 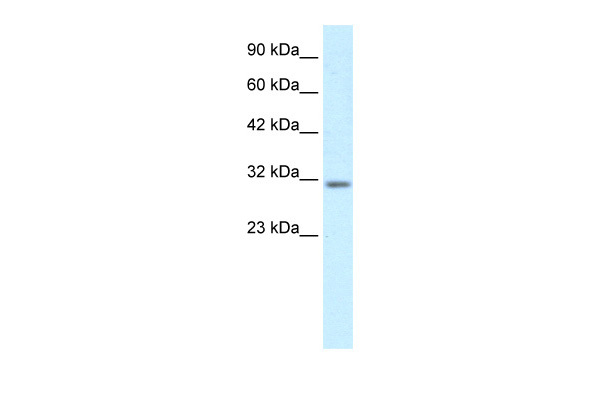 Western Blot analysis of BARX1 expression in transfected 293T cell line (H00056033-T01) by BARX1 MaxPab polyclonal antibody.Lane 1: BARX1 transfected lysate(11.50 KDa).Lane 2: Non-transfected lysate. Western blot analysis of BarX1 Antibody (C-term) in CEM cell line lysates (35 µg/lane). BarX1 (arrow) was detected using the purified Pab (1:60 dilution). 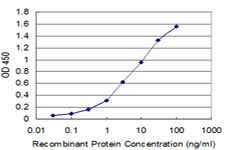 Western blot analysis of BarX1(arrow) using rabbit polyclonal BarX1 Antibody (C-term) (AP14002PU-N). 293 cell lysates (2 µg/lane) either nontransfected (Lane 1) or transiently transfected with the BarX1 gene (Lane 2) (Origene Technologies). 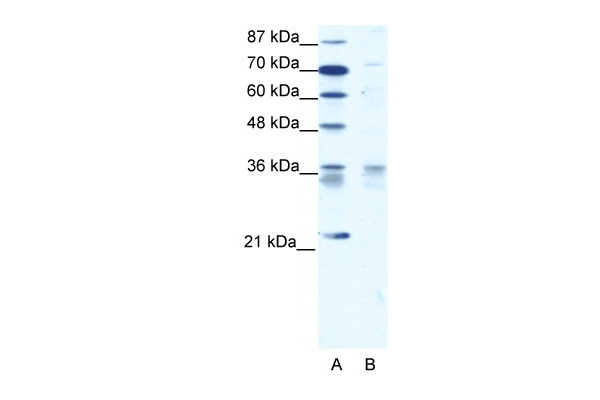 Western blot analysis of BARX1 (arrow) using rabbit polyclonal BARX1 Antibody (C-term) (Cat. #AP50342PU-N). 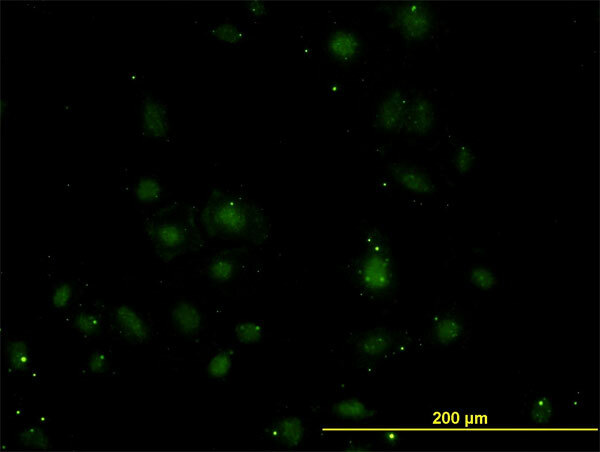 293 cell lysates (2 µg/lane) either nontransfected (Lane 1) or transiently transfected (Lane 2) with the BARX1 gene. 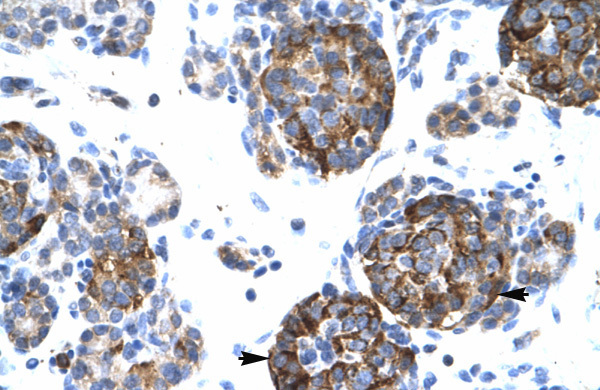 BARX1 Antibody (C-term) (Cat. #AP50342PU-N) western blot analysis in A549 cell line lysates (35µg/lane).This demonstrates the BARX1 antibody detected the BARX1 protein (arrow).